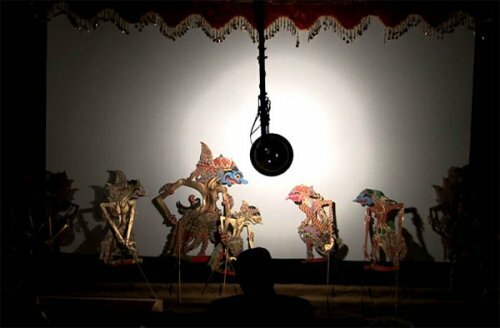 Wayang kulit is an Indonesian art form in which two-dimensional leather puppets are made to cast shadows onto a screen lit from behind. Other forms of wayang with three-dimensional puppets or even human performers are also known in the region. The flat puppets of wayang kulit are beautifully gilded and painted. In any single show there may be dozens of them representing a whole world of gods, kings, warriors, hermits, ogres, clowns, and more. All of them are manipulated by one dalang (puppeteer), who sits behind the screen and supplies distinctive voices for all the different characters. Most of the stories are taken from the Hindu epics, the Ramayana and the Mahabharata, but they have been adapted over centuries to the Indonesian context. The puppets are recognizable by their stylized physical features, the ways they move, and the quality of their voices. While the stories are essentially old and well-known by the audience, a significant part of what the dalang does is adapt the performance creatively to what is happening in the present. It was traditionally believed that the dalang was able to communicate with the unseen world. The dalang speaks not only in the familiar vernacular languages of Indonesian and Javanese, but also at times in Old Javanese and even Sanskrit—languages which are not intelligible to the human audience but are meant to be understood by the invisible audience. The ability of the dalang to perform many different voices—male and female, refined and coarse, serious and funny—is a big part of the pleasure for the audience. In villages and towns in Java, people attend all-night performances of wayang, which test the skill and endurance of both dalang and musicians. In subtle ways, he and the drummer of the gamelan ensemble communicate to move the story along. Audience members can move between the front of the screen, where they see the shadows, and the back side of the screen, where they can watch the dalang move the puppets. The attention of the audience is not continuous; people also chat, visit, eat, and even sleep. To keep them involved, the dalang switches among the various languages and styles, makes puns and jokes, philosophizes, and may comment on current events. The dalang is not only an entertainer but also an important source of information in the community and can be a powerful political force. Here is a sample of Sumunar performing wayang kulit with master dalang Midiyanto in 2011.